From I-64, take exit 282 (US13) toward Virginia Beach. At the last exit before toll for Chesapeake Bay Bridge-Tunnel, take US60 East (Shore Dr). Remain on US60 (Shore Dr) for approx. 8 miles. Turn left at traffic light onto Atlantic Drive. Follow Atlantic Ave for approx. 1/2 mile to Ft Story Gate 8. Equipment checkout and RV park check-in is Hexagon shaped building on the left, about 3/4 mile after entering Gate 8. Dump station is located next to the check-in office. Quiet campground in a fantastic location. Cabins and Bungalows available. Extremely neglected campgrounds that has a lot of potential. Amazing location but geesh it’s management has forgotten to maintain such a potentially awesome facility. Bathhouse was filthy with corroded/rust faucets, flanges and vents. Easily fix if management actually cared. During our 4 day stay the bathhouse was never cleaned, one of two sinks were not working and there’s a brown liquid coming from vent in women’s bath area. Constant reeling of sewer, mold and water. Yuck! The laundry room was convenient & usage of machines free but the flooring tiles are missing with mold present. An accident waiting to happen. AC/Heat system in window doesn’t work and missing knobs. The tiled stairs could use anti slip strips as they have water at the entrance and again another accident waiting to happen. Campsites/RV spots - No sewer hook up. Dump station unusable during or after a rainstorm. Large puddles and craters of water in pathways, and drive access. WIFI does not work at all. No Cable hook up. Up to 50 AMP hook up available and water hookup available too. Positive? Secluded location, hard to find, about a mile walk to beach access and lots of trees. Firepits, water/electric hook up. An excellent location on Cape Henry. Check in was easy, and the two young ladies at the desk friendly and helpful. It is in a grove of trees, (great shade for a July visit! ), limited number of spaces, but it was not completely full. Shade was great! WiFi was good, there is no cable or sewer, but the dump station was not far off. We loved that we could hear morning and evening colors. You could walk to the beach, but it takes a few. The beach was just beautiful, as were the two lighthouses. Very close to the Virginia Beach Strip. We did not use the bathhouse so I can't comment on that. We would definitely stay here again. I hate to write anything negative when they went out of their way to assist me in getting a spot for my visit but this campground needs some serious TLC. It just seems dirty and unkept. The sites are sandy and I am thinking would be messy during a heavy rain. Granted it would run off pretty quickly but messy if you had to leave during inclimate weather. Even though the site said only for a 30 foot or less camper, I was able to park my 42 foot fifth wheel with very little problem. Would recommend that someone go through and take a hard look at what can go where. Thinning of some of the trees on the corners would make things a little easier for maneuverability. We camp in out 3o' travel trailer at Ft. Story at least once a year (try to get three twice a year but can't always do it) coming from Central Pennsylvania. The small size, closeness to the beach, pet friendly and friendliness of the staff is why we keep coming back. No it does not have all the ammenities of some of the larger, better campgrounds but we like it a lot. We bring our bikes and ride all over the base. Plenty to do in the area and at only $22 or so dollars a night you can't beat the price. We really like the fact that other campers know what morning & evening colors are and take appropriate action and respect our flag. GOD BLESS AMERICA & MAY GOD BLESS ALL OF THE MEN AND WOMEN THAT SERVE, AND HAVE SERVED, OUR COUNTRY PROTECTING OUR FREEDOMS. THANK YOU, WELL DONE!! C.H. left this review using the Directory software: - This was our first time visiting Fort Story. 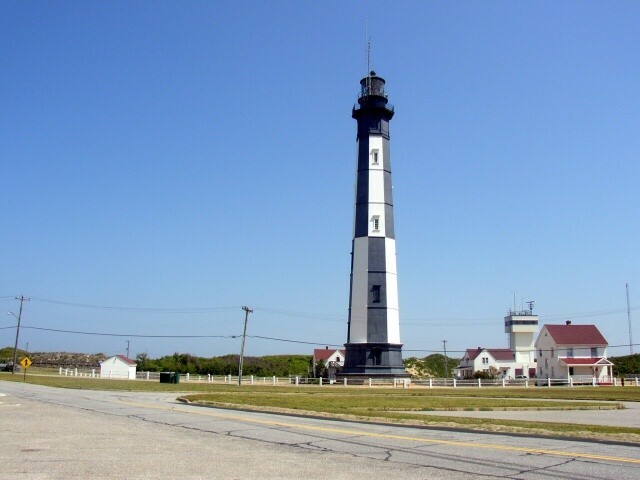 Nice liittle base with some history attached: two lighthouses, First Landing site and memorial to the French admiral who defeated the British in 1781. The campround is on the old side with dirt sites covered with pine needles. Located in a pine grove, it is quite dark. We left the CG during the day and parked by the water behind the Harbormaster's office, where we had a good view of shipping traffic in and out of Norfolk and Chesapeake Bay. The bathhoouse is in a very old cement building, but the interior was bright and clean, with free hot showers. There is a dump station out by the office. The hexagonal office where one registers is just a few hundred yards east of the two lighthouse. Stayed here for 5 days in a TT the last week of June. Generally speaking, it is a nice location with good size sites and plenty of trees providing shade. My comments are directed toward improvement of the campground section and not the rental cabins as they appear quite nice. I'd like to address a couple of points that visitors should be aware of and that I think could improve the CG with little cost or effort. Issue #1. Sewage hookups are not available on any of the rental sites. Additionally, there is no "Honey Wagon" service offered. It appeared to me that some campers were discharging grey water on the ground at the campsites instead of dragging their camper, or a sewage waste tank to the dump station when their tanks were full. Be aware that if you plan to use a towable waste tank, the folks that run this place installed several speed bumps on the only route from the campsites to the dump station. I don't recall a single one on the inbound side of the camping area, but there are several on the outbound side. Bottom line, they make towing sewage a real pain and present a hazard of rupture or other damage when towing a tank of sewage. The speed bumps appear to be made of hard rubber or plastic so the problem could be eliminated by cutting a 3' - 4' wide opening on the outbound side to facilitate vehicles towing sewage tanks as well as bicycles, etc.. As a side note, the only speeders I observed while in the CG, were CG employees driving Gator's and towing utility trailers. Issue #2. Recommend installation of a security camera and locks on the bathhouse entrance doors. Presently, there is a single entrance to a blind hallway at the front of the bathhouse building. This hallway provides direct and unfettered access to both the men's and women's bath facilities. As there is no restriction to access, or security within the CG, a push button combination lock or keycard entry system would not be a bad idea and provide at least some measure of security. Along with the installation of locks, it wouldn't hurt to add privacy louvers on the outside of the windows on the ladies side. These windows are directly exposed to anyone using the walkway ramp to the laundry room. A sign marking the laundry room entrance would also help instead of relying on word of mouth. This CG is in a good location and has plenty of potential. Despite fiscal limitations, it could be much better with minimal effort and cost. Locations are nice wooded sites. Only a few large sites. Was not too busy while we were there. The military beach is nice at the entry point. 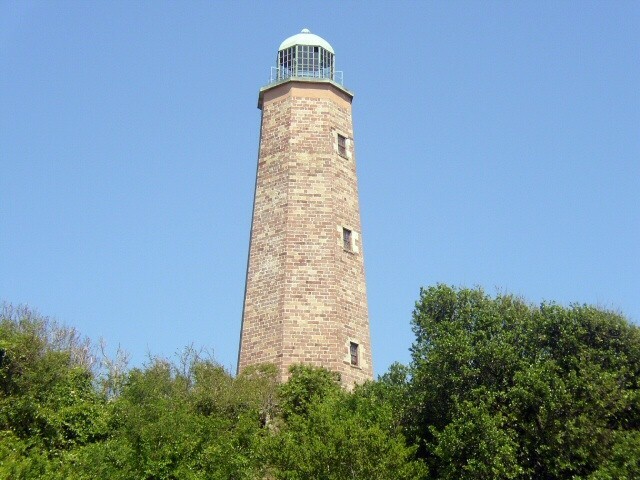 The Cape Henry lighthouse is located there and open for tours. The MWR staff was very helpful giving advice on places to eat and things to do. There is a Rec Center open weekdays and a small shoppette. Otherwise Little Creek is only a few minutes down the road. 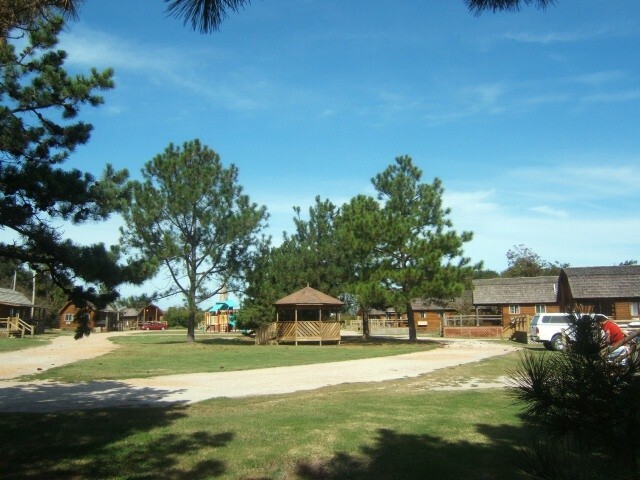 At Little creek there is a movie theater, water park (great for kids), exchange and commissary. Location is great. Plenty of restaurants nearby and only a few minutes from the boardwalk. I stopped by to check on this campground because the location is a good one. It is under new management, and the young lady I talked to was very friendly and let me drive through. The check-in building has been renovated and there are improvements being made to the rest of the facilities. All the homesteaders have been evicted. 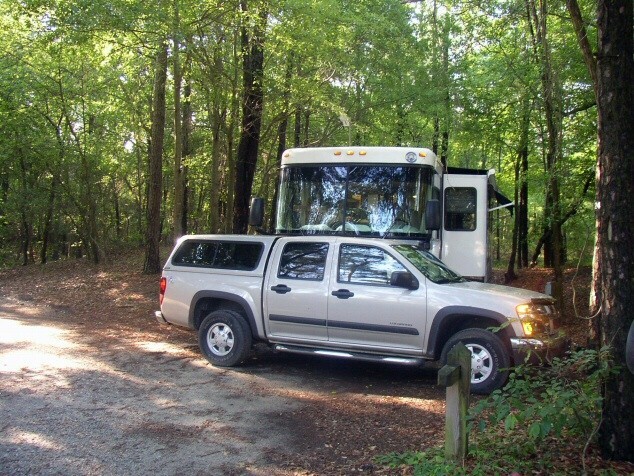 There are now 5 used RVs and 4 mini-cabins for rent in addition to the 8 larger cabins. On this day...aside for the larger cabins...there was nobody in any of the RV spots! The place was deserted! My wife and I checked out the bathhouse...aside from looking like a WWII bunker, the place was relatively clean but the fixtures were old and need replacing. The ladies side smelled "old and musty" and received a grade of a "C-". The men's side didn't smell but received a grade of "C" for peeling paint. The campsites are back in the woods, so there really isn't a view from them. Some are tight in the trees and could be a challenge for rigs bigger than 30 feet. Some require a 90 degree turn. The location is great from a "things to do" standpoint. The beaches at Fort Story look out at the entrance to Chesapeake Bay so there are always large ships sailing by. Fishing is good there too! Virginia Beach is 10 minutes down the road. First Landing state park is next door. While we didn't camp here this time (we were down the road at Dam Neck Annex) we'll keep it on our list. I didn't rate it higher than 2 stars overall because we didn't stay. A lousy campground for the money. The electricity was poor at best. If I had the coffee pot on and turned on the micro wave, my voltage went down to 100. A good way to burn up everything. The cites are not handicapped accessible nor are the toilet/shower facility which would not pass any inspection. The health issue is a major issue. For 4 people, we picked off 7 ticks during our stay. Regardless of its location, this wold be a good $5.00 a night park and not the 22 they charge. As an example, this place does not have full hook ups but on our way home we stayed at a private campground that had full hook ups, a swimming pool, a great pavilion, a ball field with grass, a paved basket ball court, cable TV and so on for $21.50 a night and it also was in a great location. It is time to shape this place up or ship it out. This rv campground needs serious maintenance. I was parked in site 6 and there was dead brush piled next to it. There was a road roller almost blocking the entrance which made it difficult to back in. There was a backhoe parked next to the site and weeds were growing up around it. So it had been there for sometime. Weeds and vines covered the area around the site. The roads are narrow and filled with potholes. Evidently, management could care less since previous reviewers have made the same comment. The signs directing you to your site are brown with red letters which makes them hard to read. Trees are too close to the road which makes it difficult to pull a camper through the park. They need to have some removed to open it up some. Other reviewers have commented about the location and other amenities, so I am only reviewing the rv campground. Finally, the dump is on the wrong side when leaving, so you have to do a uturn in order to be able to dump. I have been a camp host at three different parks and this is the WORST rv park I have encountered. I will not return to this park. All campsites are wooded with fire rings and picnic tables and are pet friendly. I had plenty of room for my 37' 5th Wheel with water and 50 amp service at my site. There is a waste dump site outside the campground. The roads are dirt with minor potholes. The bath house is old but serviceable and has a laundry in the back. I was here in July and the bathhouse was not air conditioned. 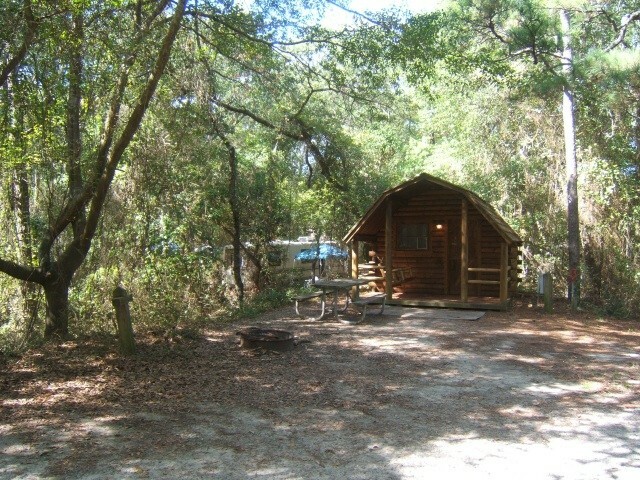 There are log cabins throughout the campground. The location is in the woods behind sand dunes and relativity quite. The military swim beach is about 2 miles up the road and it was not crowded. There is also a beach to walk on (no swimming) that is pet friendly across from the AFEES Mini mall. The mini mall was under renovation and not well stocked. There are Lighthouses to see and you can climb one (take water). This is a Historical area, it is the site of the Jamestown settlers first landing (beginning of a nation). It is only a couple of miles from the Va Beach strip and the activities. We will be back and would recommend this to anyone looking for a "camping" site and not a parking lot. Because of BRAC, Ft Story is now part of the Joint Expedition Base Little Creek/ Ft Story and you have to follow Navy requirements for sponsoring guests on base. As of April 1 spaces are $22. They seem to be clearing the spaces, however it is suited for small rv's, pop-up's and tents. Decent wash house no sewage hookups but a dump station open 0800-1700. Location is outstanding. If you want to "CAMP" you can't beat it. Nice cabins also. We were there over Easter weekend and only about half the spaces were taken. Amazing value! The sites are plenty wide to accommodate my 30' trailer with slide out and my F150. Each site has a fire ring and picnic table and is wooded. Just a beautiful rustic feel campsite. The sites are far enough away from each other and with enough foliage in between that you can feel like you are really camping. If you are looking for an RV Resort (Clear cut sites with all drive thru spots) this is not it. This is camping. There are log cabins and tent camping available as well. The sites are set up that you can back your trailer right in. When you make the reservation let the attendant know if you have a large trailer and they will set you up with an easier access site... Endless things to do here; There is a touring light house and an historic Indian village that has period actors, and the Beach..ALL ON POST! If your looking for an RV resort (Clear cut trees and cablevision) this aint it. If your looking to go camping and have tons to do out doors, this is the place. friendly people, beautiful beaches, and lots of history to explore. Bath house Facilities are older so be prepared for that. They are not bad, just old. Way better than fighting the crowds on VA beach. I will be back. First impressions are that this campground is much more suited for pop-ups, tents and small travel trailers. Road is dirt and tight, spaces will take some time to get backed into. Many of the hookups are near the front of the site which is difficult to get connected. On the positive side, this campground is close to the beach and although the base is pretty small it does have an exchange and bowling alley. In contrast to the reviews that we read we found the campgrounds to be in much better condition than expected. We arrived at 10:30am and although they have a very strict noon check in and checkout policy they allowed us to check in early. We have a 2010 40' fifth wheel with 4 slides so we are cautious about scraping it up and having enough length and width. We were given site # 2 which was more than adequate, the one drawback is they only have 2 sites large enough to accommodate a big 5th wheel or Motor home. The road while not paved was wide enough for us to back in without having to do a lot of jockeying and there were no large pot holes to swallow us up. The foliage was trimmed so that we were able to get the 13'3" high coach in and bumped out without hitting foliage. The site was gravel, but very level. The site had 50 amp service and water, pump out is available near the registration building but there is no sewer on any sites. Satellite service was not available due to the foliage, cable was not available and local TV is very limited. That was not a problem for us as the area was beautiful and we spend very little time inside. There is a small PX, gas station and car wash on the base. The beaches are sandy and private. The lighthouses are spectacular and a walk to the top of the historic Cape Henry lighthouse is worth the $4.00 and the time. While lacking some amenities it is one of the nicest and prettiest military campgrounds we have stayed at. Location is excellent for on post beaches and off-post beaches, Hookups are unacceptable for the location for the length of stay over a week, Foliage is ok but they are far behind on trimming and for anyone who has an expensive MH with the clear coating, well look to have it scratched up. This campground gives you the feeling they cater to popups and smaller trailers, Access roads and throughout the CG should at least have gravel and potholes filled. I recommend a drive thru before showing up with your RV. We only stayed for a quick weekend get away but quickly realized that we would make a return trip to stay longer and take advantage of the surrounding attractions both on and off the base. 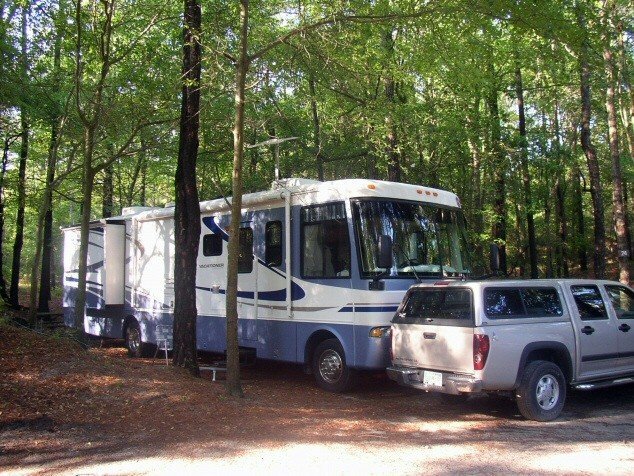 The staff was friendly and helpful and our camping,(RV),area was level enough that we did not have to work to hard to make it level for our needs. The wooded area provided for the campground provided plenty of protection from wind but just enough wind to make it comfortable. Each site was separated enough so you were not on top of anyone else. I appreciate a rustic look to a campground but could appreciate a better job done on cleaning up the overall jungle look with the vines etc. The signs leading you to the sites and the markers for the sites themselves need to be enlarged and reflective paint or tape applied to make it easier to read at night. PX small but close, however,would also like to see the check-in office/building get a face lift and supplied with simple camping needs like ice. Overall, good experience!!!! This campground goes OUT OF IT's WAY to take care of it's guests. Old? yes. Primitive? Yes. But the hospitality of the management makes it worth the visit. 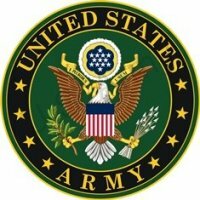 I have stayed at many military and civilian campgrounds and the management here does the absolute best with what they have to work with. Very minimal cell coverage in the campground but a short walk to the front parking lot and you've got good signal (I have Verizon and Sprint - both worked well in the parking lot). Again, the cooperation and customer service attitude of management makes any shortcomings this park may have, well worth the visit. Overall this is a great deal. For $16 a night you get water and electric. Just a short drive to the swim beach (has a lifeguard) on post and just a little further to go in to Virginia Beach. The bowling alley on post has free internet access. The campground was clean, but vines have overgrown a lot. Staff in the Outdoor Rec is very helpful and friendly. They should charge a little more and put some of that money into really cleaning up the place. As others have said - location is beautiful. Close access to beach, light house and shoppette. Staff was very helpful. Campground has endless potential but is very poorly maintained (budget issues we suspect). Bathroom is marginally acceptable - showers filthy. One washer - no dryer(s). Sites have electric and water only. Dump Station located just outside CG entrance. Inadequate cell phone coverage.